How do I change the Venuemob Manager login for my venue? New venue owner or function manager? Learn how to update your Venuemob Manager login details. Need to add a new staff member to the Venuemob Manager account for your venue? Log into Venuemob Manager with your existing details. Once logged in, scroll down to the Settings icon on the left hand side of the screen and click Staff. All existing staff members with access to Venuemob Manager will be displayed in a list. 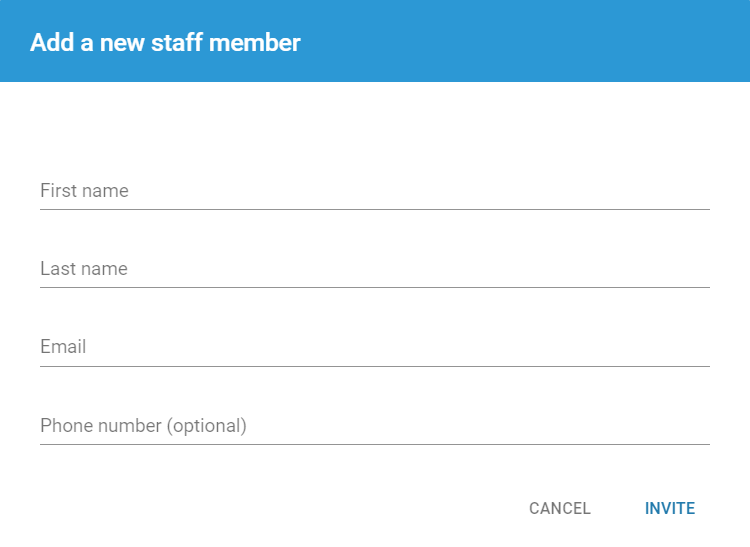 Click 'ADD' to invite a new staff member, entering their credentials. The selected new staff member will be sent an email invitation and prompted to accept. Once accepted, the new staff member will have access to all features within the Venuemob Manager dashboard. Accidentally input the wrong details? Click the pencil icon to edit or the rubbish bin icon to delete. I want to change my login for Venuemob Manager, or add a brand new function manager. If you need to update your email address, you'll first need to log into Venuemob Manager. Head to Staff and add that new email address as normal. Boom! All done. That new email address will receive an invitation email to set a password. If you really need to delete the old login for your venue, login using your new login + password combo and head to 'Staff'. Then press delete! If you're the new venue owner at a venue, or you don't have access to the old login email address (for password reset purposes), email venues@venuemob.com.au to and our team will help you out.